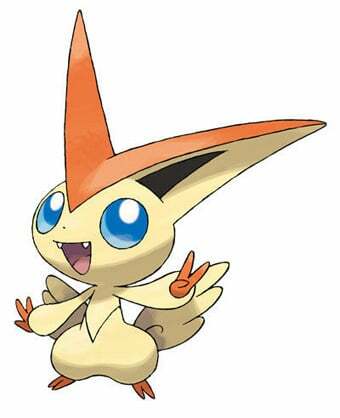 One third chicken, one third bunny, one third Pachirisu, it’s Victini. This pokémon doesn’t seem particularly groundbreaking. It just looks like a generic cuddly normal type to fill out the tall grass early on in the upcoming Pokémon Black and Pokémon White games. Now, in the biggest insult to Bulbasaur ever devised, this Victini character has stolen one of his greatest claims to fame: the first spot in the Pokédex. That’s because Victini is to be listed at Pokémon #000. Lolwut? The obvious question here is “Why?” Is this little unassuming character actually the first Pokémon? But that’s never how the numbering has been done in the past, so that seems unnecessary. Does he evolve into Bulbasaur? That seems even less likely. Maybe it’s the Eevee of starter Pokémon! No, they’d never do that, would they? Update, 8/3: Victini has been confirmed as a fire/psychic type. Interesting. Well, whatever he is, I want one. To get him, you’ll need a Liberty Ticket in-game, and to get that, Japanese gamers will need to visit a Nintendo Zone or DS station. One can assume that when the game comes out next year in the United States, we too will have to go somewhere for some promotional event to get those precious Liberty Tickets. And while the Liberty Ticket is easy to pick up, you’ll still have to earn your Victini later in the games. First V was for Victory, then V was for Vendetta, and now V is for Victini!